A general purpose, double-pole, polarised 12V 5A relay ideal for triggering sirens, strobes, door releases and other third-party equipment connected to an 800 Series call system. Can be triggered directly from any of the call system’s signal lines provided +12V and -V are supplied to its supply terminals. Typically used to switch extra low voltages. 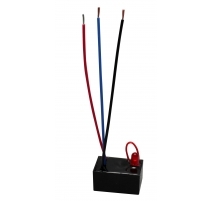 Can also switch Mains voltages provided the guidelines in the main instructions are followed. Includes a white 'write on' area for the addition of personalised text such as equipment locations. 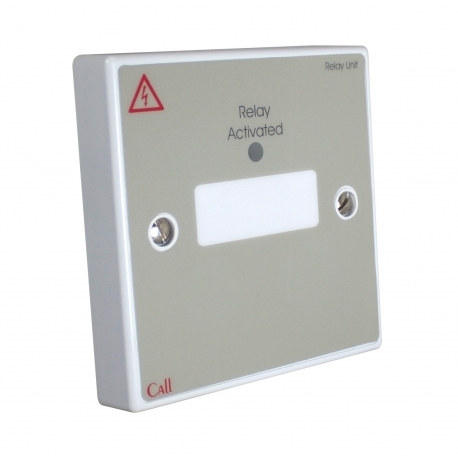 Indicators Red Reassurance LED illuminates when Relay is active. Product dimensions (mm) 30 W x 20 H x 15 D mm. Approximate length of each flying lead is 75mm. Dimensions 87 W x 87 H x 28 D mm. Operating conditions/temperature 0ºC to +40ºC. Max. relative humidity 95% non-condensing. Notes On standard calls, the relay remains energised until the call is reset. On emergency calls, the relay oscillates at the emergency call rate until the call is reset. 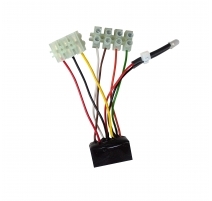 The relay contacts must not be used to switch ELV and mains wiring at the same time. Product dimensions:30 87 W x 87 H x 19 D mm. Mounts on a 25mm UK single gang back box.